Erasmo Ruiz says he has found a profession that offers stability, flexibility, and a wide range of options. To say that Erasmo Ruiz took a circuitous route to the nurse-pinning ceremony at Springfield Technical Community College late last month would be an understatement. A huge understatement. Now 34, the father of two teenagers — and the first one in his family to attend college — studied engineering at UMass. But things “didn’t go as expected,” he told BusinessWest, noting that he was into partying and girls far more than he was into his studies and eventually had to drop out. From there, he went into the Navy, specializing in electronics. But he didn’t finish his enlistment because his father got into trouble with the law and was incarcerated; Ruiz needed to get home and help support his family. He would join the workforce, trying his hand at everything from manufacturing to time as a clerk in the Post Office. Then, by chance, he got a job as a medical assistant working with a group of neurosurgeons at Baystate Medical Center. A circuitous route to be sure, but Ruiz found himself at that pinning ceremony, persevering through a two-course of study that challenged him on many levels. And many men are doing the same thing. Well, let’s say many more men, and even a phrase like that needs to be put into perspective. 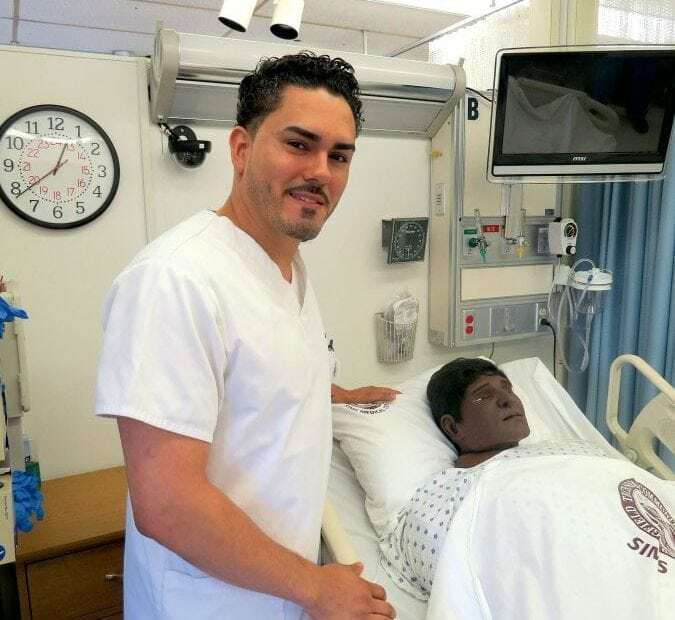 Yes, there are more men getting into nursing these days, at least compared to 40 or even 20 years ago, but the numbers still don’t approach that of women, said Karen Aiken, a Nursing professor at Holyoke Community College for the past 17 years, eight as chairman of the department. We’ll get into the numbers and the reasons they’re higher than they were, but not as high they as perhaps they should be, later. First, let’s look at some of the men who are getting into nursing. Most are not taking what would be called the traditional route, right out of high school, but then again, many women don’t take that path either. Andy Bean, 38, who graduated from Westfield State University this spring, worked in sales for a trucking company, sitting in front of a computer all day ordering parts for clients. He was laid off once when the economy took a turn for the worse and decided that he wasn’t going to let that happen to him again. So he segued into healthcare and eventually a nursing program. Actually, several of them. He’s been working toward a degree in healthcare for seven years, by his estimate, and he’s looking to make a home in the emergency room at Baystate Noble Hospital in Westfield, where he’s already spent considerable time as a technician and student nurse. Andy Bean, seen here in the ER at Baystate Noble Hospital in Westfield, likes the fast pace of that setting and wants to start his career in nursing there. Meanwhile, Nick Labelle, another member of STCC’s class of 2018, now 36, worked in everything from food preparation to sheet-metal fabrication to real estate before getting a job as a counselor in a substance-abuse clinic. It was that last stop that convinced him that he liked helping people and working in a healthcare setting. But some have taken more of a direct route. People like Brendan McKee from North Attleboro, another recent graduate of WSU. He said that, unfortunately, he spent a lot of time in hospitals in his youth visiting sick family members, and quickly realized he wanted to be part of that environment. Nursing, he said, was his first choice. 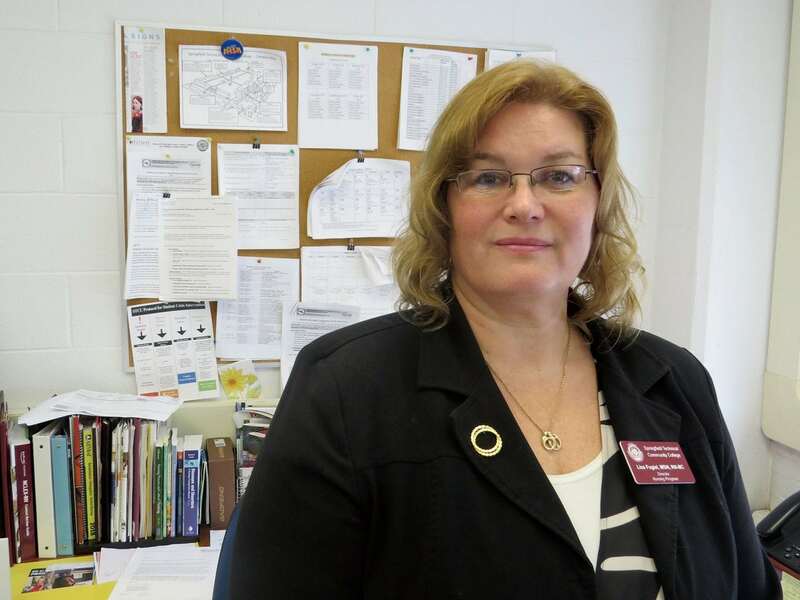 Overall, there are many reasons why nursing has become the first choice, or the second, or the fifth, for men, said Lisa Fugiel, director of the Nursing program at STCC, listing everything from solid pay to the availability of jobs as Baby Boomers retire, to the flexibility within the profession and the wide variety of options available to those who choose it. But for many, it comes down to those same ingredients that bring women into nursing, she said — compassion, caring, and a desire to help others. For this issue and its focus on nursing education, BusinessWest interviewed several men on their way to joining the profession (the licensing exam is their next challenge). Collectively, their stories help explain why the landscape within nursing — gender-wise, anyway — is changing. Bean told BusinessWest that he likes the pace of work in the ER and the fact that he’s always moving in that setting. But pace of work — and fit — are just two of many reasons why there are more men hearing their names called at those nurse-pinning ceremonies, said both Aiken and Fugiel as they discussed the changing demographics in their classrooms. They both spoke of greater acceptance of male nurses in general and among women receiving care, and, on the flip side of the equation, more acceptance of the profession as a career option among men. And both halves of the equation are important. “Women are more comfortable with women, and in some areas especially,” Fugiel noted. “But overall, there is more acceptance of men now. “And we’re seeing a steady increase when it comes to men getting into the profession,” she went on, noting that this is reflected in the numbers of men in the STCC program; there were nine in this year’s class of 74, roughly double the total from when she started 15 years ago. There are many reasons for this, said Fugiel and Aiken, listing solid pay and benefits, stability (an important consideration given anxiety about many professions in an age of ever-advancing technology), a host of opportunities, and a wide array of specific areas to get into, from critical care to medical-surgical nursing to behavioral health. “All the students talk about how there are so many options in nursing, which is one of the things that’s so enticing about the profession, whether it’s male or female,” said Fugiel. “Just look at all the options in an acute-care setting — pediatrics, maternity, ER, ICU, med-surg, and mental health — but there’s also community nursing, nursing infomatics, and managed care. While it’s good for men to be getting into the profession, given its many rewards, it is also good for the profession, the healthcare community, and society in general, to have men as nurses, said Aiken. Elaborating, she said men can and often do bring a different perspective to the work of caring for people in need. “Nurses that are female think one way, and our society doesn’t give men a lot of credit for compassion and caring,” she told BusinessWest. “When these men come into nursing, they come in for a reason — they have that compassion and want to care for people. Getting into the profession is difficult for many, she said, and perhaps more difficult than for many women because men are still traditionally the breadwinners in many families, and, therefore, it is difficult to quit work completely or go to school part-time to earn a nursing degree. 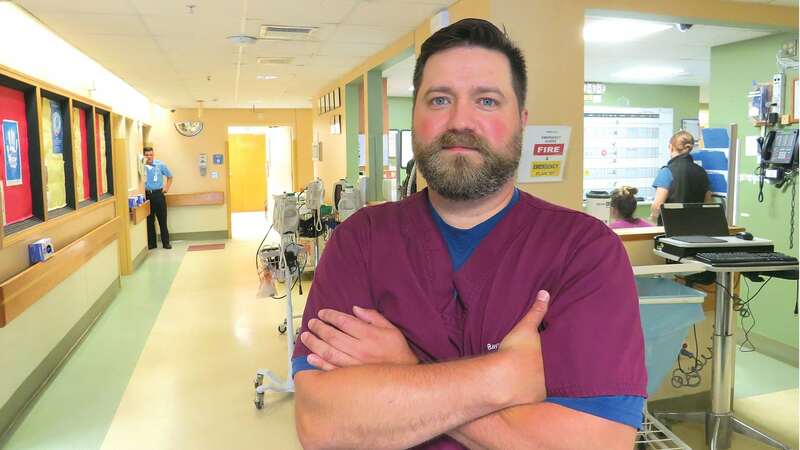 Lisa Fugiel says society is becoming more accepting of male nurses, and, likewise, men are becoming more accepting of careers in the nursing field. “The commitment, the education, is more than a full-time job,” said Aiken, adding that men often enter a program not fully understanding what they’re getting into and how they’re going to manage that commitment given their other responsibilities, and that’s why many struggle to get to the finish line or never get there. As for those that do, well, interviews with several men graduating this year provide solid evidence that men are more open to a career in nursing — and for all those reasons listed above, from the stability to the flexibility; from the nature and pace of the work to the ability to work with people. Stability was also a big consideration for Bean, who, as noted, had been laid off once and was looking for firmer ground career-wise. He was also looking for something more rewarding and with opportunities to do some ladder-climbing. As noted, he’s been going to school, part-time or full-time, for seven years now. It’s been a struggle at times, but he kept his eyes on the prize awaiting him. Job satisfaction was also a mostly missing ingredient for Labelle, who tried to find it, without much success, in fields ranging from hospitality to selling houses. He found much more of it working in that substance-abuse clinic, but desired an even higher level. “I wanted a career that would directly impact patient or client care,” he explained. “I did a variety of career assessments, and found that nursing was something that seemed to suit me with regard to compassionate care of client needs, and also something that would be challenging. As it was for Brendan McKee, who, as noted, didn’t segue into nursing; it was his first choice. He entered Westfield State out of high school, and, like all nursing students, was exposed to a number of different and intriguing paths within the profession. One of them was work in the ICU, and that’s where he is slated to work, at Baystate Medical Center, this fall. A second reason for choosing the ICU, said McKee, is that he eventually wants to work in anesthesia, and the ICU is the “gateway,” as he called it, to that specialty, just as the nursing degree itself is the gateway to a seemingly endless range of career paths within healthcare. Ruiz, like all those we spoke with, said he’s taking things one step at a time right now. That means his focus is on passing the licensing exam, which he’ll tackle in the next few months. After that? He has a comfort level on the “neuro side,” as he called it, but he’s also willing to explore. With that, he summed up why more men are getting into a profession long dominated by women. They want to make a difference, and they’re becoming more accepting of a profession that allows them to do just that. The numbers of men are not rising quickly or dramatically, but the arrow is definitely pointing up. And as Aiken and others noted, that’s good not just for the men taking this career path, but for those they will serve when they reach their destination.